In one specific location in the Himalayas in Pakistan, these salt beds were exposed to very high pressure and temperatures, forcing a small portion of the salt to form an unusual crystalline structure, different to that found in all other salts with a higher degree of crystallization. Hence, a much higher life force field since crystallization is nature’s way of storing life force. Natural salt is not a medicine, but a food..
Table Salt is just sodium chloride and negative effects of refined flour and sugar can be applied to ordinary salt..
Take quarter to half a teaspoon in the morning on the tongue after a pint of water. Hold it in hollowed tongue away from roof of mouth if possible. Allow salt to disperse and mix with saliva before swallowing. You need half a teaspoon salt per day or quarter teaspoon per 2 pints of water. So if necessary repeat the process after water in the evening. You can bathe in Himalayan Salt. 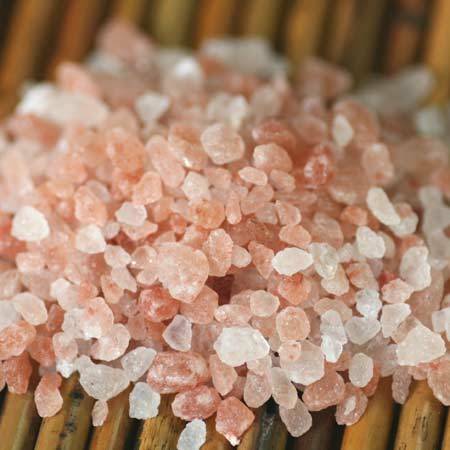 Bathing in Himalayan Salts for 15–30 minutes gives you the same effect as fasting for 3 days. 1–2 cups salt recommended. An excellent source is “Your Body’s Many Cries for Water” by Dr F. Batmanghelidj. This has recently been updated into “Water & Salt” by Dr F Batmanghelidj and Phillip Day.